Hope all had a wonderful weekend, here in the States and beyond! We had a very nice weekend in Colorado with Grandpa and Uncle Dave. We also got to see my sister and her family, as well as my parents, who were visiting said sister. Good times. I found him in the most roundabout way -- Bonne Marie has a link in her sidebar to a young woman who'd done a Lo-Tech Sweat, which I am thinking about thinking about. 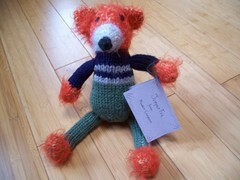 I followed the link to her blog and then to the Etsy shop, where this guy really called out to me. He's even more wonderful in person foxness. 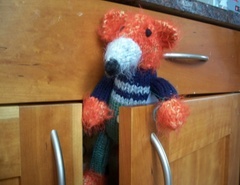 I'll be checking that shop again when I'm looking for knit toys. I just love his outfit! Thanks, Heather! He'll be a Christmas gift, so he's burrowing quietly in his mailing box for the time being. On Thursday, I realized that Ellie has no mittens. At the end of last season, she wore a crazy purple pair of gloves of mine...silly, but effective. Well, the child need mittens. I'm almost finished with a pair from the rest of a skein of Malabrigo I used last year for a hat for her and this great pattern (fourth bullet point in the middle column of text). I altered it just a bit because I know the smallest size is still a bit too big for her this year. Seriously, if anyone in Chicago wants to make anything for this and bring it to the KIP at the end of November, I'll take care of mailing them. It's only two weeks from now, I know, and note that they only want natural (and animal) fibers, though I think I read that yarns with a maximum 25 percent synthetic content are OK. Just a thought! Last night, I came home from giving an exam in time to watch most of the season premiere of Project Runway...then watched half of it again. Hooray! And tonight, I get to hang with my KIPeeps. HOORAY! Sure, I have 7 million papers and exams to grade, but life's good at night. Hope to see everyone there. I'm looking forward to seaming it up. 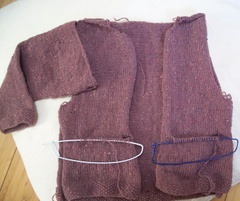 Will wonders never cease -- I'm looking forward to seaming something?! I bought a skein of snuggly Angel yarn at Loopy the other night in the midst of the Chicknits Extravaganza, which was such a blast. A great turnout at a great, new-to-me shop! I'll have to go back there soon. On Saturday, I asked Ellie what I should make with the new yarn. 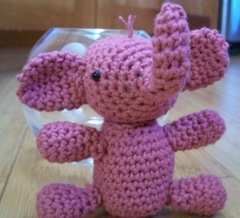 Oh, I don't think I know how to make a rhinocerous. Sure you do! First, you make a long body (stretches arms out wide) with your craft, and then you put two horns on his nose (points to nose) and then you give it four feet. Did you notice that a rhino has four feet, Mommy? Four feet! 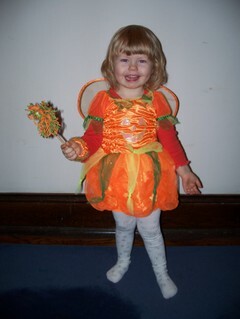 Of course, it's easy for a pumpkin fairy to say! P.S. I just followed my own link to see Bonne Marie's post this morning -- thank you for the wonderful shout-out, and what a perfect name for the little guy! I definitely took "just-in-time" gift-giving to new heights (or limits) Friday night. But the best-line-on-a-blog in ages was "Why not the Wombat?" and I felt called in some way to commemorate Wombat Week! 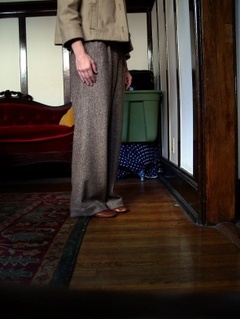 I finally hemmed some slacks. I think these were ready except for the hems at the beginning of the quarter -- this is now the final week of the quarter. Yeesh. The saving grace was that it was warm enough for much of the fall to get a lot of wear out of the navy linen pants that I finally sewed up late this summer. They were hemmed more or less as soon as they were ready for hems...of course, my mom bought me the fabric about four years ago. So maybe one-third of a gold star for me there. I am so excited about Bonne Marie's evening this Friday at Loopy! I will have a Little Someone in tow and so won't be able to stay the whole time, but these events are just a blast. I always, always learn something that helps a ton, and it's great to see all the garments in the flesh (or in the yarn and on the flesh, I guess). So let's all get Loopy on Friday night! See you there! 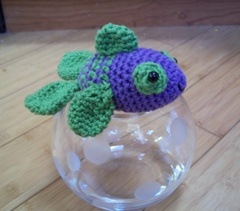 Pattern: Ribby Shell by Bonne Marie! Needles: Dang it, I just finished this a couple of weeks ago and can't remember. Unbelievable! 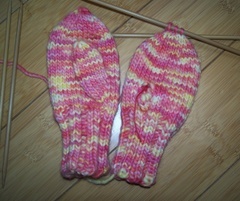 Mods: This yarn knits at a smaller gauge than called for, so I went up a size in the pattern, or possibly two. Comments: Great pattern -- clear, straightforward but with a lovely stitch detail at the neck edges. 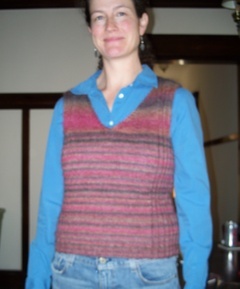 Super-snuggly vest! I hope it's not super pilly, but it'll be fun while it lasts. Big achievement of the day: Learning to use the timer on the camera! Learning to shoot in focus must await another day, apparently. Ellie named her Ashley. Since I finished her today, maybe her last name should be Toussaint. Hahaha. I'll come up with a prize for anyone who gets that! These little jobbies have become my stress reliever/treat in the midst of stacks and stacks of student papers.